For a tourist visiting Spain, Madrid and Barcelona lie very high up on his list of destinations to visit. Each day a number of tourists take the trip to these fabulous cities mostly by airplane and train. 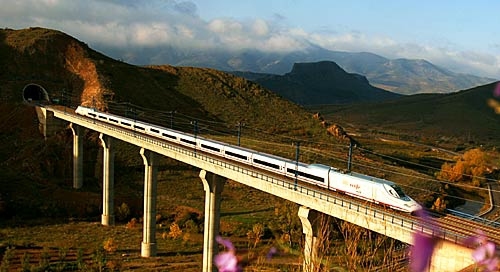 The Spanish travel industry has been boosted by the introduction of AVE train which has made it possible for visitors to travel from Madrid to Barcelona within a day. The aviation industry also has come up with a way to counter the rising popularity of the AVE trains which has resulted in the availability of a number of travel options for people commuting between Barcelona and Madrid. The average price for traveling from Madrid to Barcelona by the AVE train is £28.50. However, to get this rate, you will have to book well in advance as this route is a very popular one. You might have to end up paying more if you haven’t booked your seat on the train earlier. On the other hand, you can also get a good deal if you plan your visit in the early morning, mid-afternoon or late evening. The AVE train started transporting people from Madrid to Barcelona in 2008 and has since then become the easiest mode of travel in between the two cities. Not only do the AVE trains provide tourists a fast mode of travel, they do so for a bargain price too. This is the reason why most people prefer taking the AVE train to go to Barcelona from the Spanish capital – Madrid instead of the airplane. The journey takes about 3 hours’ time with the fastest train transporting its passengers to the Sans Station in Barcelona from Madrid Atocha in about 2 hours and 30 minutes. On weekends, the tourists can choose from 16 AVE trains to travel in between Madrid and Barcelona, while on weekdays the number of trains available comes down to 12. There is a regional train also available for the tourists which runs once in a day and takes about 9 hours to deliver the passengers to Barcelona from Madrid. This Regional Express does not run on Saturdays and stops at about 36 stations during the 9 hour journey. The night train that runs between Madrid and Barcelona can transport passengers from one city to the other in about 9 hours and can cost up to 60 Euros. The night trains usually leaves at around 10 at night and reaches its destination by 7 in the morning. The biggest advantage that you can gain by opting to travel from Madrid to Barcelona by air instead of a train is time saving. You can reach your destination in about an hour’s time if you take a plane. Air Europa flights depart from the Terminal 1 at Barcelona airport and land at the Madrid Barajas, Terminal 4. The airline runs daily flights for the passengers which are available throughout the day from 7:30 in the morning to 9:25 at night. Food is available for the passengers on the flight as well. Booking of the tickets can be done either by phone or by logging on to the official website of the airline. The airline offers passengers the chance to print their boarding passes from its website as well. Vueling flights depart from the Terminal 2B at Barcelona airport and land at the Madrid Barajas, Terminal 4. The airline runs 2 flights each day for the passengers. The timings of these flights are not constant and can be checked by logging on to the official website of the airline. The passengers can buy food on the flight as well. Passengers choosing Vueling for traveling to Madrid from Barcelona have to check in about half an hour ahead of departure. The booking of the seats can be done online without encountering much trouble from the airline’s website. Iberia flights depart from the Terminal 2B at Barcelona airport and land at the Madrid Barajas, Terminal 4. The airline runs daily flights for the passengers which are available for the passengers from 6:20 in the morning to 9:45 at night. The choice of food available for economy and business class passengers differs from one another, while people wanting kosher food have to book their flights at least a day in advance. Tickets for the flights can be booked online from the official website of the airline. Although traveling by air or by train is the faster modes of transport for traveling from Madrid to Barcelona, they cost a good deal of money. The night trains offer a cheaper mode of travel but they only run once and might not be suitable for most tourists. Besides these options, you can travel from Madrid to Barcelona via bus and car as well, which is going to take a bit more time but won’t cost you much. Buses run between Madrid and Barcelona all throughout the day and can transport passengers from one city to the other in about 6 hours. The fare charged for this bus trip is 30 Euros. The buses usually leave from the Avenida de America bus station or the Mendez Alvaro bus station. For people traveling by car, the journey from Madrid to Barcelona can take up to 6 hours. You will have to take the AP-2, AP-7 or the A-2 freeways for this journey which are all toll roads. Server responsed at: 04/26/2019 4:04 a.m.